Our softsole slipper has been our top selling slipper for years. It is treated like a sock rather than a shoe and passes the couch test. Every inch of the foot is in contact with lush Australian sheepskin. 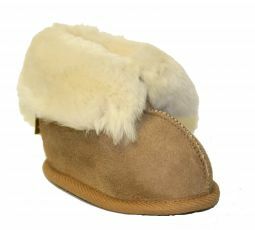 The natural wicking ability of the sheepskin keeps the foot at body temperature during all seasons. Sheep Dogs™ (a trademark of Cline Footwear, Inc.) has been a family run business since 1982. Sheep Dogs® began as a sheepskin footwear company but has expanded to include footwear for all seasons. Some of their offerings include hoovä sandals, hand crafted by them in Orange Co., California. Copyright © 2019 Cline Footwear, Inc., dba Sheep Dogs. | Ecommerce Shopping Cart Software by Miva, Inc.